Register the WWT display with a SAMP Hub. Zoom the display out as far as it will go! Send summary properties of shown CSC sources to virtual-observatory applications. Display summary plots of the properties of the shown CSC sources. A name can be given (e.g. Orion cluster or M31), which is passed to the LookUp service, or a location can be given using a comma to separate the Right Ascension from the Declination. In this latter case a limited variety of coordinate formats are supported, including 205.842, -14.8367; 13 43 22, -14 50 12; 13:43:22, -14:50:12; 13h 43m 22s, -14d 50m 12s; and 13h 43m 22s, -14d 50' 12". Find and move to the given location. This page uses the American Astronomical Society's World Wide Telescope interface to let you explore the sky coverage and source properties of version 2.0 of the Chandra Source Catalog. Selecting a point on the sky will highlight either the nearest polygon - representing a set of Chandra observations included in the catalog - or, if the CSC 2.0 sources are displayed, then the properties of the nearest source will be shown (Load CSC 2.0 Sources is used to load the data, after which it will turn into Show CSC 2.0 Sources). A set of summary visualizations of the selected sources can be displayed with the icon, or their properties sent to Virtual Observatory applications - such as TOPCAT - with the icon (if a SAMP hub is running on the same machine as the web browser). The positions of detections from the latest XMM-Newton source catalog can also be displayed, as the two surveys are complementary. More details can be found using the Help and Credits buttons. The Chandra Source Catalog (CSC) is intended to be the definitive catalog of X-ray sources detected by the Chandra X-ray Observatory, and is described in more detail on the About the CSC page. The 'Please explore the Chandra Source Catalog' page shows the Chandra observations included in version 2.0 of the CSC as polygons on the sky. The display - which is based on the American Astronomical Association's World Wide Telescope - can be panned and zoomed into (or out of) to explore the whole sky, and the background data can also be changed, showing the sky in a range of wavelengths from the Cosmic Microwave Background to Gamma Rays. 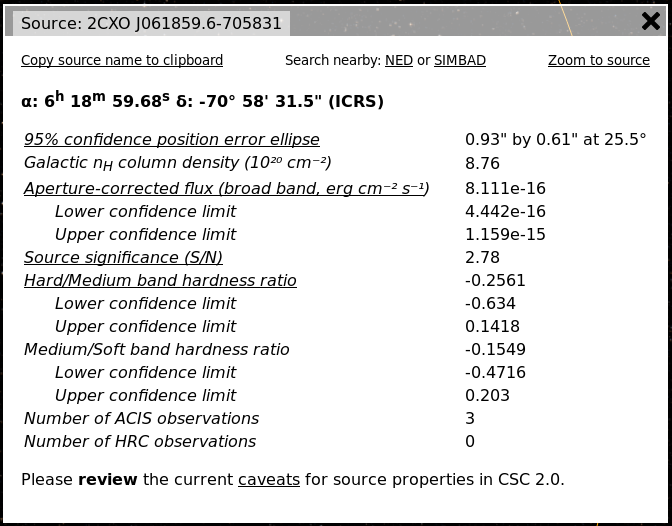 Positions of sources from the CSC and from the latest XMM-Newton source catalog can be displayed, and summary plots of the CSC source properties can be shown. The last update to the data on this page was and the Processing Status page provides more information on the current status of the catalog. The processed stacks - that is, those stacks for which the photometric properties of the sources have been calculated - are drawn in gold, and the un-processed stacks in gray (that is, those stacks for which the full source properties pipeline has not been run). The top of the control panel - above the "Chandra Source 2.0" title - contains several icons, which can be used to change the appearance or perform some action. Please note that the icons are not always shown, as they can depend on previous actions or other factors, as explained below. These two icons control whether the control panel is hidden or displayed. The zoom level of the WWT display can be changed with these three buttons. The three buttons allow you to zoom fully out (or at least as far as the WWT allows), slightly in, or slightly out. This icon appears when CSC 2.0 sources are displayed. Selecting the icon will display a set of summary plots of the properties of the displayed sources. These two icons will only appear if a SAMP hub (one that supports the SAMP Web Profile) is running on the same machine as the web browser, such as the TOPCAT Virtual-Observatory table viewer. The first icon will register the WWT display with the SAMP hub: this is an optional step but selecting it will mean that the WWT interface will both send and respond to coord.pointAt.sky messages. The second icon is displayed if a SAMP hub is available and CSC 2.0 sources are shown: selecting the icon will send the summary master source properties to any table viewer (such as TOPCAT) to support more in-depth analysis. Note that this icon can also be found in the "source properties" window that is displayed when a CSC 2.0 source is selected. In this case the full set of master-source properties for this source will be sent to any table viewer. The Enter a Name or Position box lets you quickly move around the sky. Positions are in Right Ascension and Declination (ICRS) and must be separated by a comma, otherwise the text is sent to the LookUP service to try and identify a location. The support for positions is limited to the following formats: 205.842, -14.8367; 13 43 22, -14 50 12; 13:43:22, -14:50:12; 13h 43m 22s, -14d 50m 12s; or 13h 43m 22s, -14d 50' 12". The default behavior is for the nearest stack to the selected position to be highlighted (the outline changes to cyan), and a window is displayed containing basic information about the stack: the target names used for the observations that form the stacks, and links to observation details at the Chandra Data Archive. When the "Show CSC 2.0 Sources" button has been selected, the selction mode - which is displayed in the second row of the menu bar on the left of the page - changes to "Select nearest source" - and the nearest displayed source from CSC2 will be selected. A different window is created, this time containing summary details about the source from CSC v2. The exact set of properties shown depend on the source, but the basics are the positional error, Galactic column Hydrogen density, the best estimate of the model-independent flux using an aperture correction, hardness-ratios, and several details about the data used for the source. Above the properties are links to copy the search name to the clipboard, search in the NASA/IPAC Extragalactic Database or the SIMBAD Astronomical Database within 5 arcseconds of the source location, and to center-and-zoom the WWT display on the source. More-detailed access to the CSC 2.0 source and data properties - as well as to previous releases - is available either via the CSCView application or with direct ADQL queries, as described on the How to access the Chandra Source Catalog page. Selecting "Hide sources" will return the selection mode to "nearest stack". These windows - showing stack or source properties - can be dragged around the display, in case they obscure the background. Since the data files can take some time to load, the source catalogs must be loaded - using the "Load CSC 2.0 Sources" or "Load 3XMM-DR8 Sources" buttons - before they can be shown. Once the data has loaded the button will change its label. Selecting the "Show CSC 2.0 Sources" or "Show 3XMM-DR8 Sources" button will add circles, indicating the sources, close to the location on the screen (the full catalogs are not drawn as this would result in the display being unusable!). An orange circle is drawn to show the maximum radius used for sources (only for the CSC 2 sources). The CSC v2 sources are drawn as cyan circles with a radius of 5 arcseconds, the XMM sources are drawn as green circles with a radius of 10 arcseconds. These radii are generally significantly larger than the positional error on the location; instead the values were chosen to make sure that the sources are visible! The Chandra locations are either from the CSC 2 catalog or - for sources which have not been fully processed - from the November 2017 pre-release list. The values should therefore be taken as preliminary. The XMM source locations are taken from the DR8 list as described on the credits page. The display - provided by the WorldWide Telescope - can be panned, zoomed into (or out of), and the background image changed using the list of options below. Many thanks to the software and data providers mentioned on the credits page. Without them, this interface to the CSC would not be possible! The display is provided by the WorldWide Telescope, which is funded by the American Astronomical Society. The target search uses the LookUP service, operated by Stuart R. Lowe, which provides a simple way to search Astronomical targets by name. The Milky Way outline is from the d3-celestial project - which converted the original Milky Way Outline Catalogs data by Jose R. Vieira. The configuration, close, plot, resize, reshare, search, and zoom icons are from the free version of the GLYPHICONS.com library, made available under the Creative Commons Attribution 3.0 Unported (CC BY 3.0) license. The animated "spinner" - seen when loading the source catalogs or looking up a name - is taken from the SpinKit package by Tobias Ahlin, which is released under the MIT License. The color picker widget is provided by jscolor.js, plotting by plotly.js, and the Web-SAMP functionality by sampjs. The display code is based on work originally done for the Chandra Observation Viewer and was enhanced based on the code used to create the NASA ADS All Sky Survey. The interface is also based on the excellent work done by the ESA Sky team. The 3XMM DR8 source locations are taken from the RA and DEC columns of the 3XMM_DR8cat_v1.0.fits.gz downloaded from the 3XMM DR8 catalog page, after applying the following filter: SUM_FLAG < 3. Planck is a European Space Agency mission, with significant participation from NASA. NASAs Planck Project Office is based at JPL. JPL contributed mission-enabling technology for both of Plancks science instruments. European, Canadian and U.S. Planck scientists work together to analyze the Planck data. Image Courtesy Douglas Finkbeiner. The full-sky H-alpha map (6' FWHM resolution) is a composite of the Virginia Tech Spectral line Survey (VTSS) in the north and the Southern H-Alpha Sky Survey Atlas (SHASSA) in the south. The Wisconsin H-Alpha Mapper (WHAM) survey provides a stable zero-point over 3/4 of the sky on a one degree scale. NASA and the FERMI-LAT Team. Note that no error ranges are included in these visualizations. For a more-detailed analysis try sending the data to TOPCAT (or other Virtual Observatory application) since this provides more columns from the catalog, or use CSCView to search the CSC 2.0 database. This plot shows the aperture-corrected fluxes for the sources as a function of source significance. The fluxes are model independent - that is they do not assume a specfic input spectrum - and are for either the broad or wide bands. The fluxes are taken from the "longest block" of data using a flux-ordered Bayesian Block analysis, and the significance is the highest value measured across all the observations and source bands used in the catalog. The plots use the following master-source columns: significance, flux_aper_b, and flux_aper_w. This plot shows the semi-major axis and eccentricity of the 95% error ellipse on the source location (the eccentricity is calculated from the tabulated semi-major and semi-minor axis values). The plots use the following master-source columns: err_ellipse_r0 and err_ellipse_r1 (err_ellipse_ang is available, but not used here). The hardness ratio can be estimated for sources which are observed by ACIS. The Hard-Medium and Medium-Soft values are used here, although it excludes sources with a hardness-ratio close to ±1 as they tend to dominate the plot, obscuring the detail for those sources with lie towards the center of the plot. The plots use the following master-source columns: hard_hm and hard_ms. Some areas of the sky are observed multiple times, which provides the opportunity for measuring faint sources and to look for long-term (inter-observation) variability (not just short-term, intra-observation variability). The histogram shows the number of ACIS and HRC observations for each selected source. The plots use the following master-source columns: acis_num and hrc_num.